Whatcha up to? I'm just doodling around. Which had nothing to do with doodling. It's just something we always said for doing nothing in particular. I tried to get some sewing in. It's fun to work on small projects that don't have to turn into anything in particular. 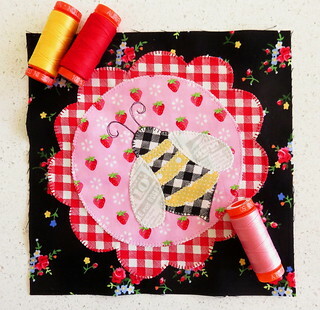 This is Pat's cute bumble bee applique that she designed for Fat Quarter Shop's Button Lover's Club. You can click on the links for information about downloading the free pattern and joining the club! Like tons of people, I love bee themed things, so this seemed perfect. It's always fun to go through my stash and find pieces just right for the project. I'm not sure yet what I'll do with this, so for now it's just hanging out being a square. I'm still in love with that black fabric that is from Pam Kitty Love. That print is so pretty in all the colors it came in and I don't have much left of any of them. Speaking of going through stuff... found some hidden treasure yesterday. For many years if I saw some cute towels I'd buy them up but never use them, instead saving them for my would-be kitchen. The one without the green tile that is. Yesterday I was going through my little hall closet I found paydirt. And trust me.. tip of the iceberg. 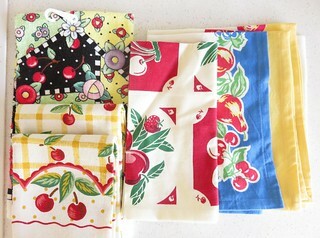 Now I have some new towels for my pretty white kitchen! Yay. That little closet has lots of treasures in it. 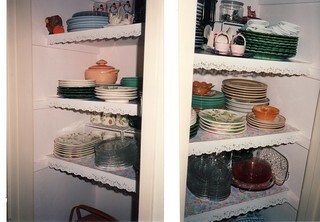 Originally it was the utility closet, just a space for the vaccum and mop.. but I turned it into a little china closet, stored all my luncheon sets and fancy bowls and silverware. It was pretty, and arranged .. not just crammed in willy nilly. I loved it. That was back in my "Martha Days" .. unlikely to be repeated even with the new kitchen. Now the little closet is now crammed with little or no thought for display, mostly just for storage. But I have fond memories of it. This was taken in June 1992. I was born to be an instagrammer. These are two of several photos. Of course over time things moved around, new things added. Eventually I got a big hutch and dishes moved there and different things moved here. Fun to dig out the photo and see it again. Because when I saw it yesterday it was crammed to the gills and not at all nicely arranged. Anyway I'm doodling around collecting up things that I don't use anymore. Lots of treasures that I'll send out to Goodwill for someone to find and be excited about! What are you working on? Love the beautiful bee! Love the pretty shelves....you really were meant to be a blogger!